I arrived in time for the two-year-olds despite the bane of my life, the replacement bus. There was a lot of coltish behaviour going on, especially by Irukandji and Mumbles. But Long Leaf, Sanglier and Oohood all looked good and duly took out the trifecta while I watched on. In the three-year-old fillies I was quite taken by Yulong Xingsheng with its head in towards the strapper. The horse romped in at $2.30 for the place. In the Zipping Classic the old boy looked great at the age of 16 and I am reliably informed that his prominent white sock on the near hind had some of the old Bold Personality treatment! The Taj Mahal looked fine, especially if you are sympathetic towards cross-over nosebands, and won well. 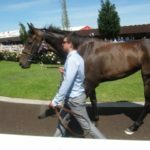 In the Guineas I spotted a standout and a possible future champion. Villermont looked stunning in the yard. The horse had a chequered run but still brained them. It’s hard to see that I will ever get $2.70 the place about this horse again! Two out of two for a top day and over two hours to contemplate my success on the wretched replacement bus going home. In the Oaks Pinot was a standout in the parade ring doing plenty of laps. Nice pricked ears, showing some rib, and a typical fit Waterhouse horse from the rear. Head down when saddled up. But I was disappointed to find odds of $1.70 for the place so I just watched it go around. On the news it said that it was an upset win? An upset, at $1.70? 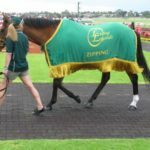 I arrived early on Stakes Day for the two-year-olds where Tony McEvoy had two live chances, the colt Run Naan and the filly Belzella. 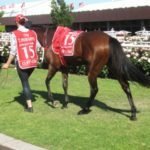 The colt was rearing and roaring in the mounting yard and coyly described on the PA as being “coltish”. 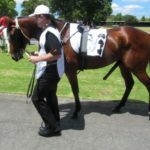 The filly was relaxed and head down and fortunately for me fell in for third at $2.70. In the mares race another standout Waterhouse horse Savapinski streeted them at $2.00 the place. Gai’s stable is on fire! And Redzel in the Darley Classic was probably the best horse I saw all week and I was very happy with the $1.80 for the place. But no bet in the Stakes. 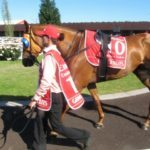 I couldn’t fault Gingernuts who looked great in his stall with a positive strapper, but looked ordinary in the yard, and the three-year-old Cliff’s Edge, who looked like a good head down horse. I’d pretty much decided to back the three-year-old when the warning siren sounded. Gingernuts was out! And that put me out too, totally spooked! Cliff’s Edge place odds plummeted from $2.70 to $2.20. I put my cue in the rack. Happy to go home with three out of three! There are, apparently, two types of serious punter. Clockers and watchers. 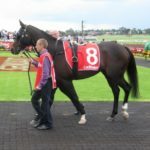 It is not often that I wander over to the dark side but last week I spent a couple of days out at Werribee to cast an eye over the internationals. My attempts at clocking were fumbling and rudimentary, but to my untrained eye and hand Max Dynamite looked the goods. And so to the Cup. 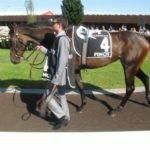 Usually I place my bet in the last minute before the jump once I have watched all twenty-four horses parade in the mounting yard. But today, in response to the poor conditions for watchers at Flemington, I metamorphosed into a clocker. And can you believe it I placed my bet on Max at 13.41, 79 minutes before the jump! I’m like a broken record. I’ve said it before and I’ll say it again – Derby Day, the greatest day of racing on earth. But today, there’s a problem, apart from the weather. There’s an icy wind which requires deployment of my heavy duty winter coat to prevent hypothermia, and a blazing sun which requires the simultaneous deployment of my straw hat to prevent sunburn. Oh how I love my Melbourne! 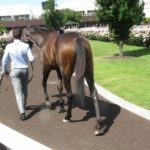 My mission today, should I decide to accept it, is to work out a way to follow a horse from the stalls and/or parade ring to the mounting yard. And of course that’s the problem. There is a building site in between. I try two strategies – an inside run and an outside run. I go first for the outside run up the public lawn. It works well for the Wakeful Stakes and I manage to spot a relaxed Luva Luva in both stall and yard. It should be a strong chance in the Oaks. The inside run is harder and involves battling through the betting ring and finding a hidden pathway next to the building site which leads to a pop-up bar area cluttered with stools and tables, but good mounting yard views. I try the inside run for the Lexus, but fail dismally. For the Myer Classic I go outside again but the crowd has built up to more than 80,000 and it’s virtually impossible to weave a way through. I’m going to blame the crowd for picking a disappointing loser in Heavens Above. I give up for the Derby and just pick the winner Ace High based on his good appearance in the stall. Cup Day will be difficult. I hope I don’t self-destruct.